The Nokia 9 PureView will sport a 5.99″ PureDisplay with 2K resolution and run on a Snapdragon 845 SoC under the hood. Nokia fans all over the world are eagerly waiting for HMD Global to release its next flagship smartphone, the Nokia 9 PureView. A recent report suggested the smartphone could be formally unveiled in January 2019, a few days before the Mobile World Congress kicks off in Barcelona. Ahead of its official unveiling next month, we have obtained a promotional video that not only shows off the upcoming flagship smartphone in all its glory but also reveals some of its key features. 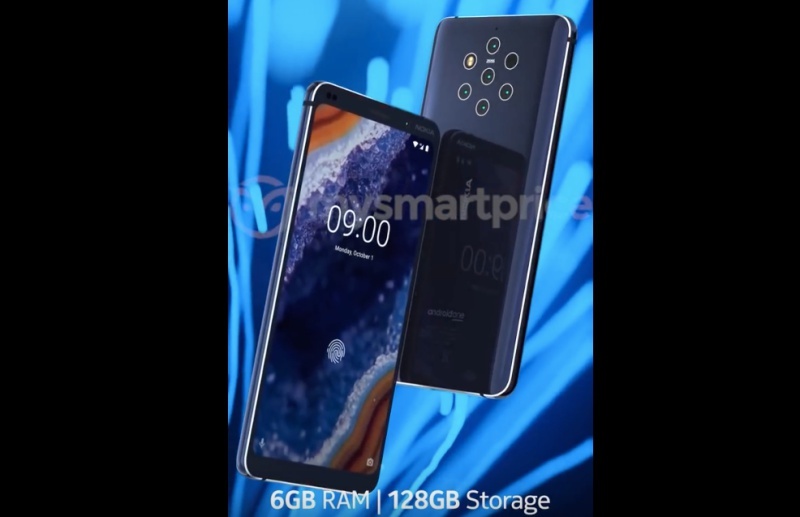 The Nokia 9 PureView render shared online by leakster @Evleaks earlier today appears to have been captured from the same video. As you can see in the promotional video below, the upcoming Nokia flagship smartphone will not be significantly different from the current Nokia 8 Sirocco in terms of design. We can also see that the smartphone has a glass back and a solid metal frame in the middle. Under the hood, Nokia 9 PureView will be powered by Qualcomm’s Snapdragon 845 mobile platform, clubbed with 6GB of RAM and 128GB of internal storage. Even though the promo video does not actually confirm it, we are fairly certain the smartphone will include a microSD card slot for further expansion. If the folks over at Nokia Anew are to be believed, the Nokia 9 PureView will be officially unveiled by the end of January 2019. If their info is indeed accurate, this means HMD Global Oy does not want to wait until the Mobile World Congress to unveil its next flagship. MWC 2019 kicks off on February 25th this year so the Nokia 9 PureView could be launched roughly a month before the world’s largest gathering for the mobile industry. In case the smartphone does go official next month, it may go on sale in most markets before the first wave of 2019 flagship Android smartphones is launched. Posted in Blog, Tech Corner and tagged @Evleaks, #mcsc, #Qualcomm, 128GB of internal storage., 2K resolution, 6GB of RAM, depth-of-field, Exclusive, HDR10 compliance, HMD Global, January, leakster, Mobile World Congress, Nokia 9, Penta-camera, PureView, Qi wireless charging, revealed, Snapdragon 845, The Messiah.